Course of the Week Highlight: Presentations that Pop, PMI Agile Certification and More! Have you ever been nervous about presenting in front of a group or running a big project? We’ve all been there, but with a little bit of training, it’s possible to become a pro at both. This week’s Course of the Week deals feature courses to help you design and deliver presentations that pop, as well as achieve PMP Agile certification. Additionally, we’ve got two courses to help make sure your office is a safe environment for you to deliver and lead such projects. Now through March 11, save up 30-70% off on these engaging courses. 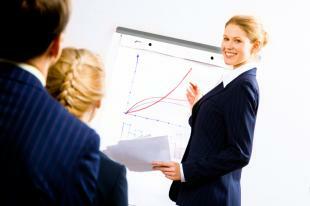 Become a presentation pro with this four hour course from Turpin Communication. Employees will learn how to prepare presentations, manage nerves, and engage listeners with interactive presentations. The course includes reusable job aids to have handy when designing presentations down the road. Make your presentations pop for only $34/learner through March 11, a savings of 42%! Effectively train both managers and employees on sexual harassment prevention with these courses from Vivid. The employee course teaches learners how to identify behaviors and what actions should be taken should they witness an incident. The manager course also covers these topics, as well as how managers should handle complaints. Both courses are 45 minutes and include video, simulations and inline quizzes to ensure learners understand their responsibilities. Promote a safe workplace with these courses, both only $8.40/learner through March 11. In this course from PMI-approved provider Simplilearn, employees will gain the knowledge they need to prepare for the PMP Agile Certified Practitioner exam. Using audio-video lessons and quizzes, this course covers agile tools, techniques, and the skills project managers need to be successful. Get ready for the PMI-ACP exam for only $99/learner through March 11. All deals run through March 11. Discounts will show up at checkout.